All-Over Print Funny Swag Squirrel Shirt for Men, Women & Kids from AnimalShirtsUSA. 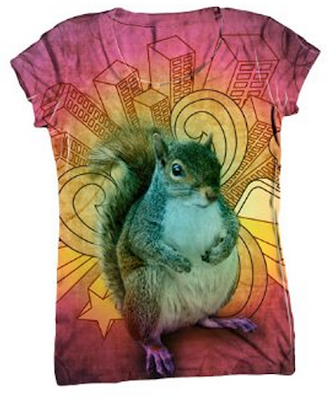 This swag squirrel shirt is the urban counterpart to the all over print forest squirrel shirt. Bright colors, city skyscrapers, and a big squirrel image provide for an engaging design. Like all shirts from AnimalShirtsUSA that are all-over-print, the printing process means that every shirt has unique imperfections. You can see some of these imperfections above, where a few wrinkles in the shirt are still white. Follow the links above to see more examples and learn more about their printing process. While some will see the "unique imperfections" as a plus and others will see it as a negative, there's no arguing about the shirt quality. The company offers shirts in soft, durable fabrics that come with a guarantee that the printed images will never flake or peel. Guarantees like that are hard to come by.